Immigration reform, executive action: A bipartisan immigration reform bill (S.744) passed the Senate in 2013. It had enough votes to pass in the House as well, but House leaders refused to bring it to the floor. House Republicans did not introduce a comprehensive immigration reform bill of their own. Due to this congressional inaction, President Obama took executive action in November to allow some undocumented immigrants to stay temporarily in the U.S. The largest category of beneficiaries will be parents of U.S. citizens or permanent residents who have been in the U.S. for five years or longer (and who meet other requirements). The action also expanded the Deferred Action for Childhood Arrivals program and a separate waiver program. The program is expected to benefit less than half of the undocumented population. Left out will be parents of undocumented immigrants, those without children and many with minor criminal convictions. Central American migration: In recent years, there has been a significant increase in the number of immigrants leaving Honduras, El Salvador, and Guatemala and seeking refuge in other countries, including the U.S. The causes for this migration include violence (extortion, homicides, gang recruitment and domestic violence), lack of jobs, the pursuit of better education and medical services, and family reunification. In August, the House passed a bill that would have weakened protections for child migrants and increased border militarization. The bill did not pass in the Senate. Meanwhile, the Obama administration placed thousands of migrants—mostly mothers and their young children—in two new family detention centers and expedited their deportations, raising concerns that asylum seekers are being denied due process and being sent back into the dangerous situations from which they fled. Office activities and new resources: Staff spoke at Weavers Mennonite Church in Harrisonburg, Virginia, Emmanuel Mennonite Church in Gainesville, Florida, and with various college groups. Staff co-led a workshop at the Urban Anabaptist Ministry Symposium in Philadelphia and moderated a panel on non-violent action at a regional conference in Florida. In October, MCC staff from various locations in the U.S. visited 12 congressional offices to discuss Central American migration and other issues. A collaboration with Mennonite Church USA created the new Sunday school series, “Radical Hospitality,” which features MCC staff in two of the six videos. 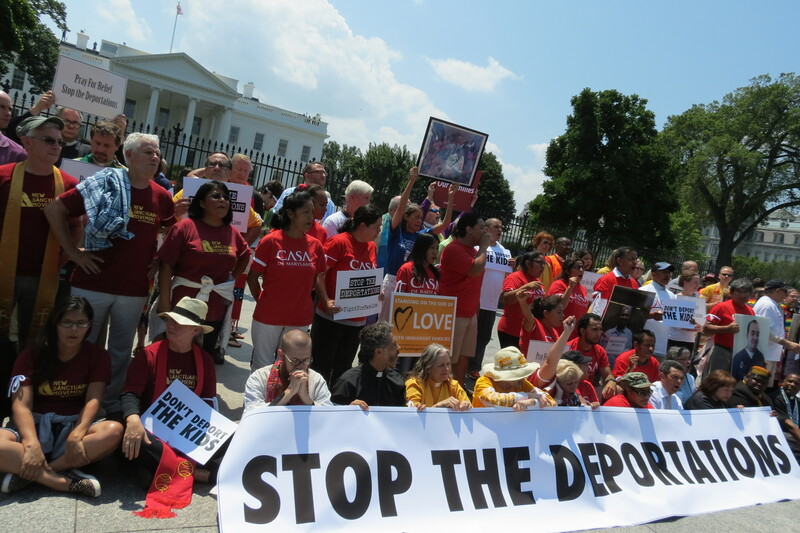 Our staff continues to provide leadership to the Interfaith Immigration Coalition and collaborates with partner organizations on letters, campaigns and webinars. New MCC resources include web pages on Central American migration and the president’s executive action and, with the broader coalition, a pastor’s toolkit and seven new policy briefs. Looking ahead: Unfortunately, it is extremely unlikely Congress will pass an immigration reform bill in the next session, or any time soon. In 2015 expect to see bills proposed to increase immigration enforcement, including border militarization. The Obama administration will likely continue its expansion of family detention. At the same time, the increased migration from Central America presents an opportunity to raise awareness about root causes— which include U.S. trade policies, the U.S. war on drugs, and our historical military involvement in Central America.